Poor irrigation can damage your lawn. Find out how & why. When areas of our lawn die, we typically assume the damage is due to a particular pest or disease problem and we rush to apply a chemical treatment. But have you considered that it could simply be poor irrigation coverage that’s causing all those brown spots? More often than not this time of year, lawns that we inspect for suspected disease problems are actually suffering from spotty irrigation. Are you sure that your irrigation system is laid out in a way that gives you full coverage? Often, based on where irrigation heads are placed, the pressure on the systems and types of heads used, coverage is irregular. If you haven’t had your irrigation system audited in a while, it’s probably time. 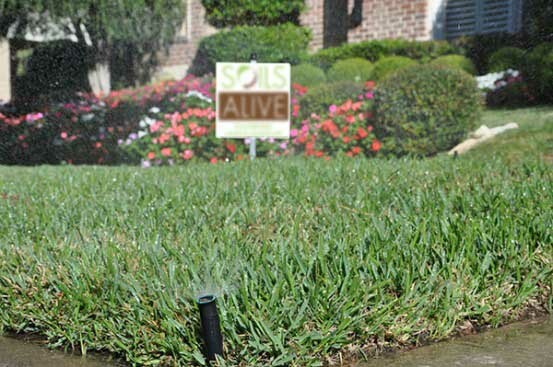 Broken or unbalanced sprinkler heads and leaks can also be culprits when you have spotty irrigation coverage. Repairing these issues and possibly moving sprinkler heads can go a long way to helping your lawn thrive. For the right amount of water to be reaching your entire lawn and landscape, you should expect a small amount of overlap from your sprinkler heads. If you make sure that water is not hitting concrete instead of plants and that leaks and pressure have been fixed, there won’t be waste. In summer, when soil is very dry or compacted, it can be difficult for it to absorb a lot of water all at once. This can cause irrigation water to run off instead of getting to your lawn’s roots. If your soil is very dry or compacted, you may want to split your watering time up into two separate cycles. You can use the A and B cycle to do this. If you plan to run your system for 30 minutes, then you’d run all zones for 15 minutes on the A cycle. Then, have the 15 minute B cycle set to start about an hour after the A cycle finishes. This will allow time from the first watering to absorb thoroughly before the second cycle begins. If there is an issue with your lawn, it’s best not to wait. Early diagnosis and solutions are the best way to successfully treat what ails your lawn and landscape. If you need help with your lawn, call us today.